Check it out, and make sure to stick around until the end for a giveaway of Pierson's Mr Darcy's Little Sister! Anyone who reads pre-Victorian literature or watches period films has come across an episode in which a character is ill and they are bled by their doctor. Sense and Sensibility, Jane Austen’s first published book, now celebrating the two hundredth year of publication, is a classic example. When Marianne Dashwood becomes seriously ill after her disastrous relationship with Willoughby, her doctor bleeds her to try and reduce her fever and save her life. My friends, who know I have an interest in the history of medicine, often ask me, “What’s with the bleeding? Was this really a treatment, and what were they trying to accomplish?” Yes, indeed, bleeding was a major treatment for a number of disorders before the mid-1800s, when a massive wave of medical scientific discoveries completely changed the practice of medicine. Medical science in England before the modern era was based on concepts first delineated by ancient Greek physicians, such as Hippocrates and Galen. These principles were distilled into the holistic medicine (treatment of the entire body or constitution) practiced in the Georgian and Regency Eras. Human health was a situation where the patient’s constitution was balanced between “weakness” and “plethora.” Plethora was diagnosed in conditions where the patient became more red and warm, and might include fevers, localized infections such as cellulitis (where affected areas of skin become red and swollen), inflammatory arthritis (such as gout), and pregnancy (where the skin is typically more pink and warm than usual because of the increased blood volume during pregnancy). Weakness, on the other hand, was any condition that would make the patient paler, thinner or weaker: blood loss, fainting, chills, or wasting diseases. The treatment of plethora included changes in diet to avoid anything which was thought to be “heating”, and generally meant anything red, rich or fatty, or stimulating. Foods to be avoided included red meat, eggs, spices, and stimulants such as wine, coffee, and tea. “Cooling” foods were encouraged, such as fruits and vegetable, and simply prepared meats. In addition, physicians would take blood from patients to directly remove the “excess” blood that was engorging their patients and causing them to be red and hot. This treatment would be likely to help patients with gout, where there is an excess of uric acid in the blood caused by too much red meat and red wine and not enough of the enzyme which breaks it down. This results in red, hot joints, most commonly in the big toe and the knee. Fever was a common medical problem because of the lack of antibiotics and vaccinations (except for smallpox vaccination, which was widespread by the Regency Era). With this theory of health and disease states, bleeding a patient who was hot and feverish to decrease the fever made perfect sense. We cringe at this because we know that removing blood also removes white blood cells which fight infections, and weakens a patient who is already struggling with infectious organisms. Pregnant women were often given “reducing” diets, not to decrease weight, but to decrease their plethora, or excess blood and heat. These “reducing” or “lowering” diets would consist of foods which were simple and “cooling”. These would include plenty of fruits and vegetables and limited red meat and heavy sauces. The improvement of constipation, which is common in pregnancy, on this diet was taken as encouragement that the diet was working as it should. Fortunately for the patients and their babies, most women did not follow these diets as strictly as their physicians would have liked. Women who had a history of miscarriage or infertility would be more likely to rigorously follow the suggestions of their physician, and to change physicians if their condition did not improve. Patients who were pale and weak, such those who were having chills in the early stages of a cold were encouraged to have a “heating” diet and could eat as much red meat and drink as much wine, especially red wine, as they wished to warm an overly cool and weakened constitution. They would also be treated with heating treatments, such as mustard foot baths or mustard plasters to the chest. In this case, of course, blood-letting was not used. An interesting historical side note to this treatment was the condition of the Prince Regent and his father, King George III. The king is well known for the periods of insanity from which he suffered, which eventually became permanent and required that the Prince of Wales become Regent. A number of medical historians believe the King George III suffered from a form of porphyria, an inherited disease in which the patient lacks one of the enzymes required to break down hemoglobin into smaller molecules which can then be excreted by the kidneys. The major symptoms of hereditary porphyrias are abdominal pain and psychiatric symptoms. The treatment of porphyria, still used today, is to remove blood from patients until they are slightly anemic and thereby decrease the number of porphyrins in their blood. The Prince Regent had a long history of various types of illness, including abdominal pain, and he was a great believer in blood-letting, having it done whenever he felt unwell. His symptoms might have been from his unrestrained eating and drinking, but if they were an indication of porphyria, his enthusiasm for having his blood let might have prevented him from developing the severe mental symptoms from which his father suffered. 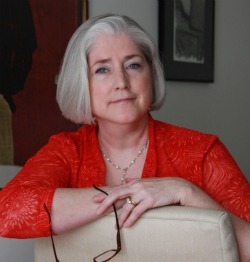 C. Allyn Pierson is the pen name of physician and novelist Carey A. Bligard. She is interested in the works of Jane Austen and in the history of medicine, particularly that of the Regency Era. She lives in Iowa with her husband and two dogs. Darcy and Elizabeth have found their happily ever after - now it's Georgiana Darcy's turn! Joining her brother and his new bride, Elizabeth in London is a dream come true for the shy, sweet Georgiana Darcy. Eager to learn to negotiate polite society from her graceful and composed new sister-in-law, Georgiana is ready to make her entrance into the matchmaking and intrigue filled ballrooms of London. Making her way through the sea of rogues and fortune hunters, Georgiana will make the transition from being simply Mr. Darcy's little sister to a confident young woman with her own engaging story to tell. 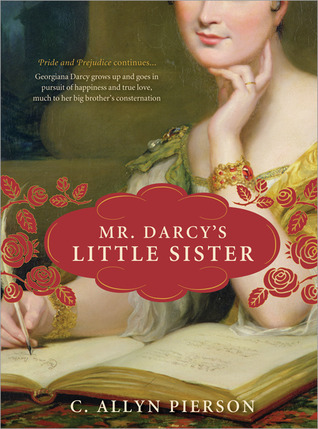 C. Allyn Pierson has graciously offered up a copy of her novel, Mr Darcy's Little Sister for a giveaway! Leave a comment or question for C., or let us know what Regency-era practice fascinates/freaks you out! Blooding really freaks me out! I can believe people let doctor do that to them, I mean, didn't they feel weaker? I'm grateful to be living in the era just for the medicine, hehe. Believe it or not, using leeches is making a comeback. Doctors are now using them when they reattach limbs. But blood letting is one of the things that really gets me. I have also read that they would change a babies' diaper for months at a time. Yuck. that was WAAAAAY to much information for me, but i couldn't stop reading it!!!! thanx (?) for the share!!! LOL!!!! & thank you for the giveaway!!!!! I did not mention leeches in the article as they are just another method of taking blood, but they were definitely used. And yes, leeches have made a comeback for reducing hematomas (pockets of blood) from surgeries or trauma. A hematoma takes a long time to resolve and if it is the result of surgery, where there is an opening into the skin, they can be a dangerous breeding ground for infection, as well as causing a risk of the wound pulling open. I personally would rather die than have a slimy leech put on me, but perhaps I would change my mind if I were seriously ill and couldn't fight back! I already knew some of this, thanks to my mom being a nurse and happily telling me all manner of things that I'd really not rather know (usually while I'm eating). But still, it's really fascinating. Wasn't George Washington killed by bloodletting? Fascinating, Carey, as always! And I always find that sickroom scene in S&S one of the most moving ever, especially in the 1995 film. Thanks for the post on blood letting. I have always been interested in this medical treatment after seeing S&S! It is interesting to learn how different eras treated medical conditions. What do you think of the modern day practices of using sterile, medical grade leeches and maggots for different wound treatments? 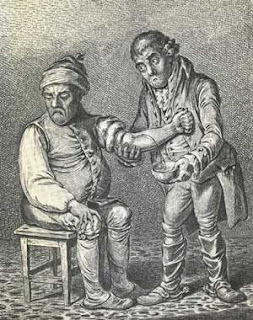 The actual act of letting blood was performed by surgeons rather than doctors. In the era, a physician rarely touched a patient except to take a pulse and might recommend letting but a surgeon (or barber!) would do the deed. A surgeon was considered a tradesman - a doctor was a professional. Even later when surgeons got some respect they were still called 'Mr' - only physicians were called 'Doctor'. There was a short scene of Marianne bled in the '95 Sense and Sensibility. Creepy. Another bizarre practice of that era (forgive me for being vague on exact methods) was either inducing with or sniffing some kind of powder or liquid that I do know contained a trace of arsenic. This was used to make their complexion pale which was very fashionable. Eww, **shivers** thank you for the disg, I mean, lovely post. (Dubious look on face). Actually, I have found old forms of medicie to be fascinating in a gross kind of way for a long time. If you think this is bad, read about what the Ancient Greeks and Egyptians did! Thank you for the giveaway, I really want to read your book! I love all of the weird old "bad" remedies. There are some colorful medical descriptions in Chaucer's Canterbury Tales. Doctors back then were not so well-respected as they are today. A few odd practices still remain. For one, maggots are still used to eat out the dead flesh in badly burned patients. They eat only the burned skin, and leave the healthy! Yes, Margaret, arsenic was used to improve the complexion. You should read Dorothy Sayers' Strong Poison with Lord Peter Wimsey which involves this. Arsenic was used into the mid-20th Century in something called Fowler's solution to treat asthma, as well. Unfortunately for these uses, if you use arsenic too long for your complexion you start getting brown spots and long term use causes Squamous Cell Carcinoma of the skin. You can recognize the patients who have it because they get small, thick lesions which are pre-cancerous on their palms (where you would never see sun related cancers) as well as on other areas of the skin. Hope everyone enjoys their dinner tonight! Maggots for cleaning wounds freaks me out, but they do it now-a-days still for people with burns. The maggots eat away all the dead flesh. SO GROSS!!! Another "remedy" that I have come across and that always seems weird to me was the blistering that I gather was used quite often. I can understand poultices being used but actually using hot pokers and such to cause huge blisters must have been very painful for the patient. Thanks for the giveaway and please enter me. Blood letting has to be pretty high on the list for me. Leeches freak me out! They're so gross looking. I also am slightly freaked out about some of the harsh chemicals that we used to treat various ailments with. You have to wonder how many people were more hurt than helped! fascinating! i like learned about hot and cold food remedies. Meg: I think that the best you could hope for in the Regency was to not hurt someone. Venereal diseases at the time were treated with mercury compounds, which were highly toxic. The meds that they had that DID work were: laudanum and paregoric (both liquids containing tinctures of opium and used for pain, diarrhea, overwrought nerves, and insomnia), and digitalis (derived from the common foxglove, digitalis purpurea, and used for "dropsy," meaning swelling. Digitalis is still used occasionally for congestive heart failure, but must be used carefully as the dosage window between therapeutic and toxic is very narrow). They also had smallpox vaccination with vaccinia (cowpox), which was very common in the Regency (the lady of the house, having been convinced of the need, would often vaccinate all the servants herself). buddyt: I do not have any idea why they thought blisters would help anything or why a poultice to the feet would help a headache. Maybe the mean kids on the playground were right- if your leg hurts and they punch you in the arm and say, "How does it feel now?" they were merely continuing a historic method of medical treatment! The blood letting kind of freaks me out. I'm not someone who automatically cringes at blood. Instead, what I worry about is how sterile the tools are that they would have used to do so. Uhhh, blood letting is pretty much on top of my list of things that are freaky from that time period. That and a sense of hygene that leaves something to be desired ;-) ! Liz and Birgit: Yes, since the germ theory had not yet been formulated and accepted(Koch's postulates describing how science was to determine if a microorganism caused a disease were published in 1890), these doctors had no clue that there were bacteria all over that could cause infection, in spite of the recognition of microorganisms under the microscope by Anton Van Leeuwenhoek in the late 1600s. This was really a problem almost until the turn of the twentieth century- obstetricians wore their coats covered with blood from deliveries (it showed how successful and busy they were). If one of their patients developed a postpartum infection (called puerpural fever) it would be carried on his hands and clothes to all of his patients and many women would die. Oliver Wendell Holmes in the US and Ignaz Semmelweis in Vienna propounded the infectious cause of puerperal fever just before 1850, but their views were considered extremely controversial by other practitioners and largely ignored for years. William Halsted, the eccentric first surgeon at The Johns Hopkins Medical School, invented latex surgical gloves in 1890 to help in his insistence on a sterile operating field in surgery (and to protect the hands of his nurse-and later wife-whose hands broke out from the mercuric chloride used to kill germs on the hands before surgery). Halsted persnickety insistence on sterility and his long, drawn out, careful surgeries, trying to not damage healthy tissues, earned him the scorn of many of his colleagues in spite of his successes. Poor communication and resistence to new knowledge and techniques sacrificed the lives of many young women who could have been saved with simple soap and water. I think blistering and bloodletting were horrific forms of medicine. Oh, I think nothing freaks me out more than the practice of bloodletting. Gross. Leeches freaks me out. I hate insects crawling over me. I HATE leeches, I can't stand them :S The idea of voluntarily having them on me is beyond belief haha :) Corsetry always put me off too, I can't believe the lengths women went to in order to fit into their dresses nicely. I think it's probably of an earlier time, but the practice of lead-based face makeup is horrible as well. In the Victorian era death photography was very common business. As most people could not afford to have their photo taken, have portraits painted or even owned a camera the only time when many people had their photo taken for the first and last time was after death. It was known as postmortem photography. Many photos of apparently sleeping children were actually taken after death. I think this practice is actually quite scary, but not as frightening as blood-letting! Bloodletting definitely freaks me out but I'm very interested in how they treated "mentally ill" people. What their thoughts were and how they went about curing them (if they even did so). Leeches are very interesting...and I really think the context of these medical practices is important to remember...considered quite normal for the day! The bloodletting always gets me...it's like...ugh ::shudder:: But then, I can't even handle getting simple fingerprick-bloodwork done, so maybe I'm just a sissy, LOL! the information on blood letting is interesting, especially on George III and the Prince Regent. Thank you for sharing and for the generous give away.